Turkish President Recep Tayyip Erdoğan on Friday stated that Turkey and Germany had reached a consensus to revive cooperation mechanisms between the two countries. Erdoğan is on a three-day state visit to Germany and will meet Chancellor Angela Merkel three times. Relations between the two countries have been badly strained in recent months. Erdoğan also called on Berlin to extradite supporters of the Fetullah Terrorist Organization (FETÖ) residing in Germany, the group behind the defeated 2016 coup in Turkey. He also urged Germany to designate the network of FETÖ as a terror group. Chancellor Merkel responded by saying that Germany needed more information in order to classify it as a terror group. “We take very seriously the evidence Turkey provided but we need more material if we are to classify it in the same way we have classified the PKK,” she said. FETÖ terrorists are led by U.S.-based Fetullah Gülen, who orchestrated Turkey’s July 15 coup attempt and is the mastermind behind a long-running campaign to overthrow the state through the infiltration of Turkish institutions, particularly the military, police and judiciary. Since the failed coup, operations have been ongoing in the military, police and judiciary as well as in state institutions across the country to arrest suspects with alleged links to FETÖ. Describing Can Dündar, a Turkish journalist who had been convicted of espionage, as an agent, “This person is a convicted criminal according to Turkish law,” Erdogan said. In May, 2016, the 14th High Criminal Court in Istanbul had convicted Can Dündar, the former editor-in-chief of Cumhuriyet daily, following the publication of images purporting to show arms being transported to Syria in trucks belonging to Turkey’s National Intelligence Organization, also known as the MIT. 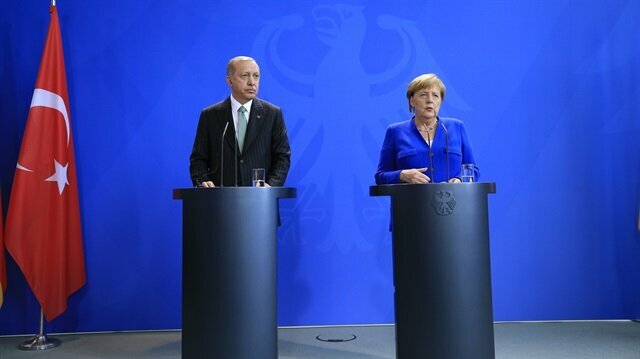 Merkel said that she agreed with Erdoğan to aim for holding a four-way meeting in October to discuss the situation of the opposition-held Syrian region of Idlib. “We also talked about Idlib and we will talk in more depth tomorrow. We are in favour of there being a four way meeting between the Turkish president, the Russian president, the French president and me,” Merkel said. Turkish President Recep Tayyip Erdoğan’s visit to Germany will be “a milestone to open a new page” in bilateral relations, the Turkish foreign minister said on Thursday. 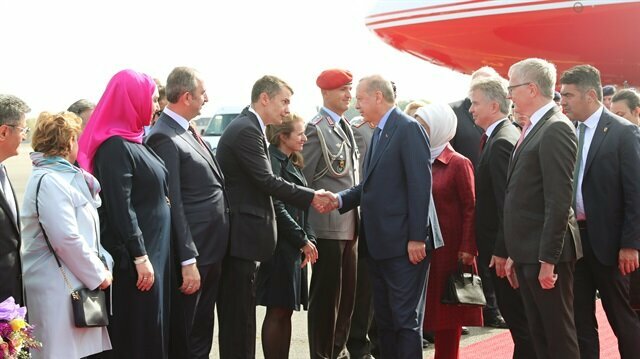 Erdoğan arrived in Berlin on Thursday for a three-day high-profile state visit aiming to improve political and economic relations between the two countries. During his visit, Erdoğan will meet his German counterpart Frank-Walter Steinmeier and will hold talks with Chancellor Angela Merkel. 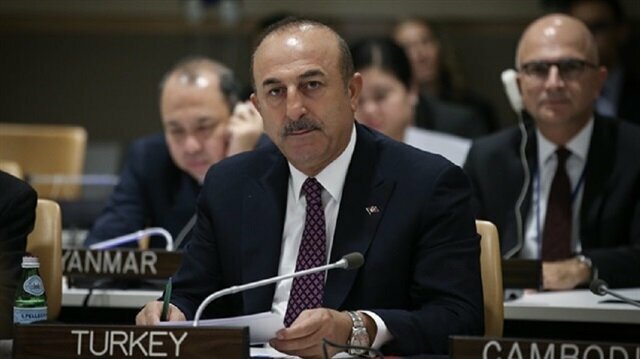 Speaking to reporters following a meeting in New York on the sidelines of the UN General Assembly, Mevlüt Çavuşoğlu also said the Idlib agreement between Turkey and Russia was “an achievement of Erdoğan and Russian President Vladimir Putin, which was also supported by Iran”. On Sept. 17, Turkey and Russia agreed on a demilitarized zone in Syria’s Idlib. Turkey and Russia also signed a memorandum of understanding calling for the “stabilization” of Idlib’s de-escalation zone, in which acts of aggression are expressly prohibited. Under the pact, opposition groups in Idlib are to remain in areas where they are already present, while Russia and Turkey will carry out joint patrols in the area to ward off renewed fighting. Turkish President Recep Tayyip Erdoğan arrived in Berlin on Thursday for his first “state visit” to Germany as president.Senior German officials welcomed the president and the first lady Emine Erdogan at the military section of Berlin’s Tegel Airport.Turkish president is accompanied by key ministers during the visit, including economy, finance, trade and industry ministers. “Everybody knows what Turkey has been doing about migration but we also told them in all meetings, including bilateral meetings, that they have to be more sensitive about burden-sharing,” Çavuşoğlu said. “We have received strong support from everybody we have met. Even in the meetings that we did not attend, everybody including [U.S. President Donald] Trump thanked Turkey,” Çavuşoğlu added. “The U.S. has cut aids to UN Agency for Palestinian Refugees [UNRWA]. Turkey is collaborating with other countries to meet the deficit,” Çavuşoğlu added. On Aug. 31, Washington cut all its funding to UNRWA, to which the U.S. had been — by far — the largest contributor. For who and what is the PKK avenging Kurds?